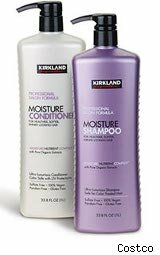 You don't need to be a Costco member to get a free sample of the warehouse's Kirkland Signature Professional Salon Quality Moisture Shampoo and Conditioner. (Kirkland is Costco's in-house brand). Available while supplies last. To get a free sample, share your name, address, email and date of birth. Filling in your gender is optional. You'll also be asked four multiple choice questions about your shampoo habits. By requesting the freebie, you're also joining Costco's email list. You can unsubscribe later, however. This line of hair cleaners purports to be ultra-luxurious, sulfate-free and safe enough for color-treated hair. The formula is paraben free and gluten free, so it is vegan. Caveats: The free sample will take 4-6 weeks to arrive. Available to U.S. residents only. One sample per household. You must be 18 or older to receive this sample. Check back later today and through the week for more fantastic freebies on WalletPop.